Collage artist Alexis Anne Mackenzie pushes her artistic practice to greater abstraction and complexity in relation to the work she presented less than a year ago. 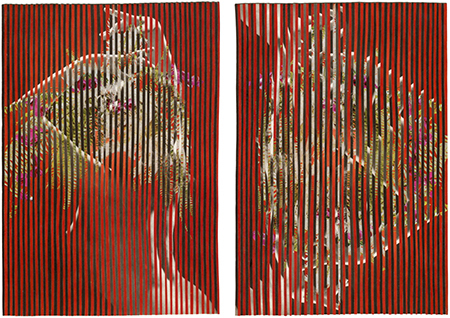 Comprised of small pieces, several of them diptychs, Mackenzie methodically cuts one or two images into strips — curved arches, straight verticals, and wavy verticals — of roughly the same thickness and adheres these over another image at regular intervals that are the thickness of the strips. Thus, the images remain visible, albeit now variably stuttered, and with varying degrees of recognizability. For the diptychs, the same base image is used. One piece features a set of strips over the base. For the other she uses those that are left, such that the pieces strongly relate but also demonstrate how, given different sets of information from the same pictures, things can look vastly different. The results are mesmerizing. The evenness of the repetition of the strips sets up a meditative rhythm. And movement is created by the vacillations of the strips, as well as the shape of the strips themselves (the works with the arched strips call to mind a record, which speaks to the artist’s avid interest in music). Then there is the intense visual engagement, as the eyes are compelled to continuously shift emphasis so as to pull out one image. A longer look reveals greater details in an individual image — flowers, female figures — and then, as the eye begins to bring into focus another of the images, the first image appears to fade, becoming almost ghostly. At times, the images all work together to form yet something else again. Mackenzie does an amazing job of playing forms from different images off of each other. While the concept at its heart, given the visual complexity, is relatively straightforward — it’s an interweaving of images — the resulting optical playground evocatively teases with ideas of how much to keep hidden and how much to reveal.